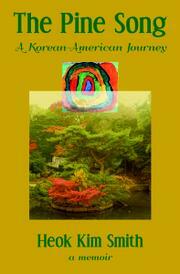 Smith explores the culture of death and her Korean roots in this debut memoir. Following the death of her father, Smith, a Korean immigrant, faced a crisis of purpose. Married, in her late 20s, and living in San Diego, the loss of her father and her resulting contemplations of mortality led her to understand that, although she was happy, she was unfulfilled. She decided to go to college (her husband did, too), where she was introduced to the world of art and art history and realized that she was “a creative being.” After a decade in academia, however, she needed more. Her gaze turned inward to her own history. After initially rejecting her Korean roots following her immigration to America, she came to embrace them as a bridge to her family and their history: her grandfather who opposed Japanese occupation; her parents who met and lived in the Chinese city of Harbin; her dead father; her mother, suffering from dementia. Knowing their stories became her creative project, and, with her husband, Smith traveled to Korea and China to learn more. What began as a book about her grandfather and the Korean independence movement quickly morphed into the biography of an immigrant family in three different countries and a memoir about how death can illuminate life with a new, profound brilliance. Smith is a talented writer, though she spends more time than necessary on her American period of prolonged postgraduate noodling, recalling influential professors, recounting books and movies that moved her, and attempting to figure out her vague but worthy calling. She attributes great meaning to the small signs she encounters in her daily life—she once saw five four-leaf clovers, which she determined to be a message from her dead father. Things pick up about 100 pages in, when the author explores Korea’s history and her family’s relationship to it. Her discoveries are genuinely interesting and lend a moving (if tardy) urgency to the book in the same way they lend increased meaning to Smith’s sense of herself. A memoir of self-discovery set against an immigrant’s investigation of her family’s past.